When any person comes up to your place of business, the first thing they see, or do not see, is the parking area. Everybody knows that concrete is the best option, but it is also expensive to put in. Concrete also requires care and a regular maintenance plan. If concrete is not an option, then some sort of asphalt product may be right for you. We work with other contractors to provide new asphalt or concrete, but we provide maintenance for asphalt or concrete lots and driveways. No matter what your striping needs, preparation is key to getting quality results. With the right equipment and experience, when we leave your area, it will be a Clean Stripe. In general, if you have a surface that needs to be clean, we can clean it. 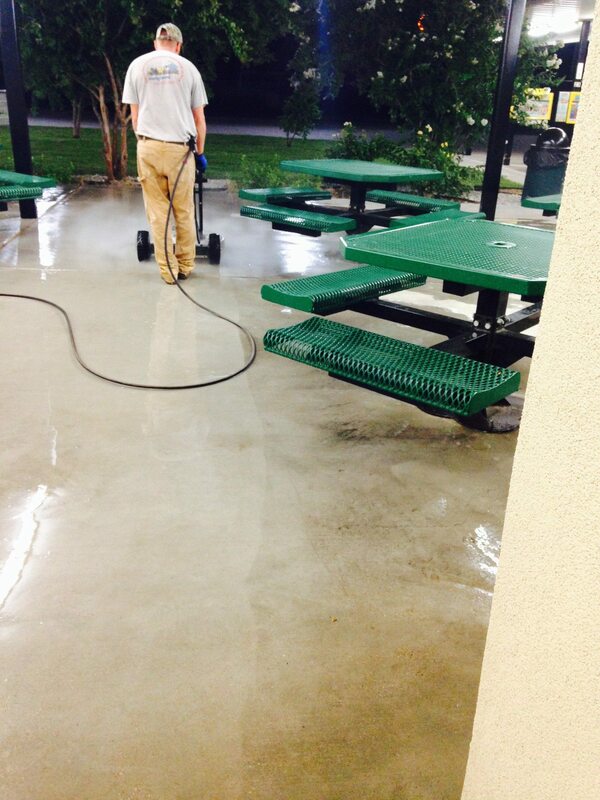 We use Hot or Cold water with pressure and/or chemicals to clean the surfaces. If you own asphalt, you know that it needs regular maintenance. We can clean the cracks, repair potholes, and seal it all up again.